Get involved in the Q‑munity! 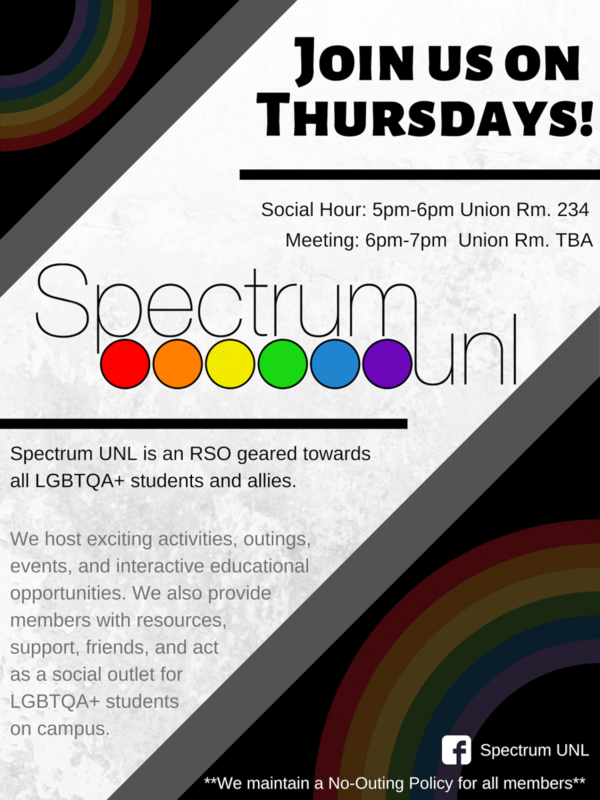 Spectrum UNL is a student organization geared toward all LGBTQA+ students and allies. We engage our members in exciting activities, outings, events, and interactive educational opportunities. We also provide members with resources, support, friends, and act as a social outlet for LGBTQA+ students on campus. Be sure to check us out for our weekly social hour at the Union in Room 234 on Thursdays at 5pm followed by our weekly meetings at 6pm. For a list of our meeting topics, see our Meetings page! For the most up to date information, you can like us on Facebook, join our closed Facebook group, or follow us on Twitter at SpectrumUNL. You can also reach Spectrum for questions or comments at spectrumunl@gmail.com.